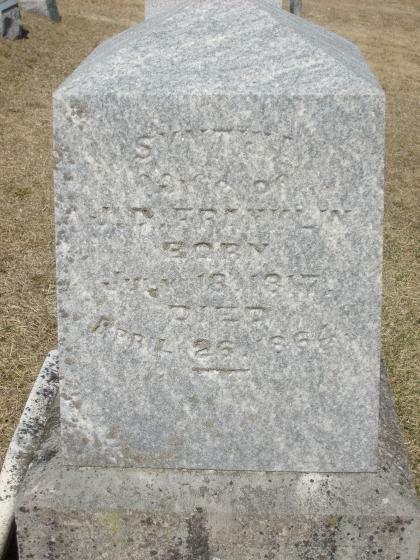 Born Jul 18 18151,2,3,4,5 [Jul 18 18176], Overton County, Tennessee1,2,3,4,5. She married Jared Durkee Franklin, Oct 1 1839, McLean County, Illinois.1,3,7,8,9,10,11,12,13,14 Jared, son of James Franklin & Anna Utley5,6,15,16,17, was born Nov 20 18145,6,15,16,17 [Nov 28 181418, Mar 20 18141,4,19], Brooklyn Township, Windham County, Connecticut5,6,15,16,17. 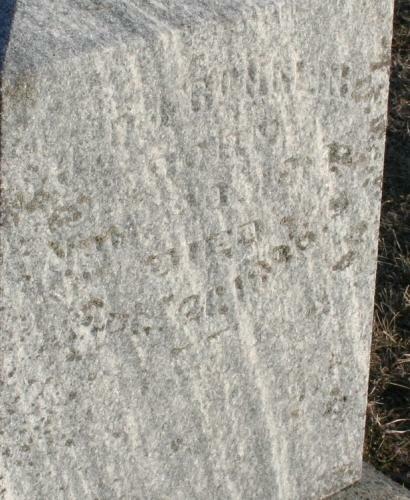 Laura Franklin, born Aug 10 1840; married - Mitchell. George Franklin, born Jan 11 1842. Allen Franklin, born Sep 9 1843; married Alice Mitchell. Candice/Candace Franklin, born c1845/c1847; married - Arrowsmith. Anna/Annie Franklin, born Mar 9 1850 (c1848); married - Johnson. Jared D. Franklin, age 46, born in Connecticut; farmer; $5200 real estate; $1000 personal property. Cynthia Franklin, age 44, born in Tennessee. Laura Franklin, age 19, born in Illinois; attended school. George Franklin, age 18, born in Illinois; farm laborer; attended school. Allen Franklin, age 16, born in Illinois; farm laborer; attended school. Candace Franklin, age 15, born in Illinois; attended school. Anna Franklin, age 12, born in Illinois; attended school. Benjamin Franklin, age 6, born in Illinois; attended school. Harriet Franklin, age 4, born in Illinois. Cynthia Hinshaw died Apr 26 18646,18 [Apr 15 18621,3,4], Kansas Township, Woodford (now McLean) County, Illinois6,18; buried East White Oak Cemetery, Kansas Township, Woodford County, Illinois6,18. Franklin, Jared, age 56, born in Connecticut; farmer; $12,000 real estate; $500 personal property. Franklin, Candace, age 23, born in Illinois; keeping house. Franklin, Anna, age 21, born in Illinois. Franklin, Benjamin, age 15, born in Illinois. Johnson, William, age 24, born in Indiana; farm hand. Franklin, Louisa, wife, age 56, born in Illinois; parents born in Tennessee. Brown, J. Hardin, step son, age 22, born in Illinois; father born in Tennessee; mother born in Illinois. Brown, E. Mary, step daughter, age 19, born in Illinois; father born in Tennessee; mother born in Illinois. Franklin, J. Benjemin, age 26, born in Illinois; father born in Connecticut; mother born in Tennessee; married within the year; farmer. Franklin, E. Almeda, wife, age 18, born in Illinois; parents born in Illinois; married within the year. Jared died Aug 7 18901,3,4 [Aug 7 189619, Aug 21 18966]; buried East White Oak Cemetery, Kansas Township, Woodford County, Illinois1,3,4. 1860 census, Stouts Grove P.O., Kansas Township, Woodford County, Illinois; roll M653-241, page 850, line #28, dwelling #1580, family #1578. "Custer's McLean County", by Milo Custer, in the LDS Family History Library, microfilm #0897324, item 5. "McLean County Marriages, 1831-1841", by Milo T. Custer, F547 M16 C87 in the Sutro Genealogical Library in San Francisco. McLean County Historical Society; McLean County book A pg 132/138. LDS IGI, citing: "Barbour collection: Connecticut vital records prior to 1850"; Barbour, Lucius B. (Lucius Barnes), 1878-1934. 1870 census, El Paso P.O., Kansas Township, Woodford County, Illinois; roll M593-295, page 314, line #28, dwelling #6, family #6. 1880 census, Kansas Township, Woodford County, Illinois; roll T9-0262, ED 237, page 557C, line #33, dwelling #21, family #21. "The Past and present of Woodford County, Illinois"; Chicago: W. Le Baron Jr. & Co., 1878; http://www.ancestry.com. Ancestry "Public Member Trees" data by "rwav_1". 1860 census, Stouts Grove P.O., Kansas Township, Woodford County, Illinois; roll M653-241, page 850, line #37, dwelling #1581, family #1579. 1880 census, Kansas Township, Woodford County, Illinois; roll T9-0262, ED 237, page 557C, line #31, dwelling #20, family #20. 1880 census, Kansas Township, Woodford County, Illinois; roll T9-0262, ED 237, page 557C, line #37, dwelling #22, family #22.